This is Taylor V's Cupcake Friday layout that I adapted to this card using SU's Handmade Holiday die cuts and papers. I thought this was a really serene setting for these elements. I used by Copics again for coloring and accents. The dots along the right corner and bottom edge were created with fabric applique' paint. 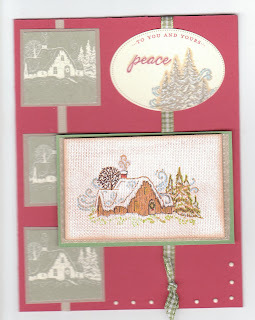 I stamped the "peace" on the die cut sticker on top. The linen background creates a "canvas" look to the image. I hope you enjoy looking at my card and come visit me again real soon! WOW!! all three of these last cards are fantastic!! i love the colors of the lily and billy and the poppy one is perfect!!! back to the grind today...ugh.